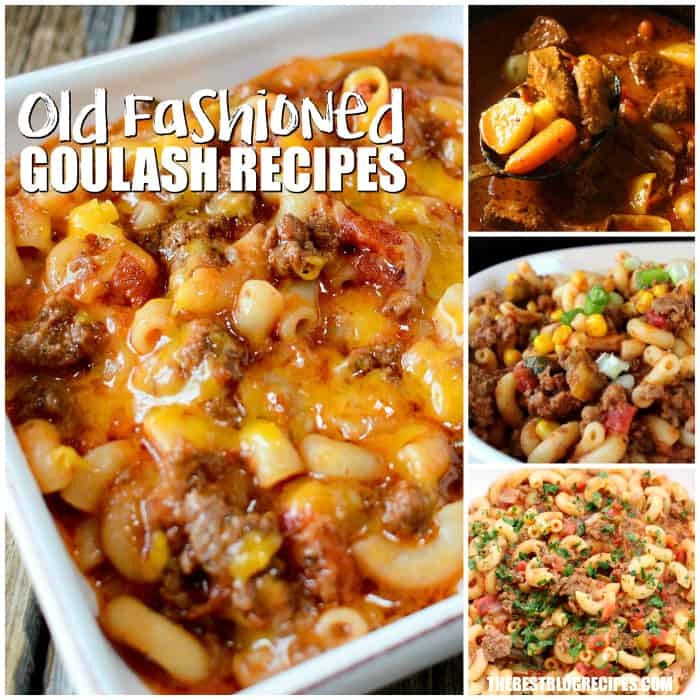 Who doesn’t love Old Fashioned Goulash just like grandma made? No one! 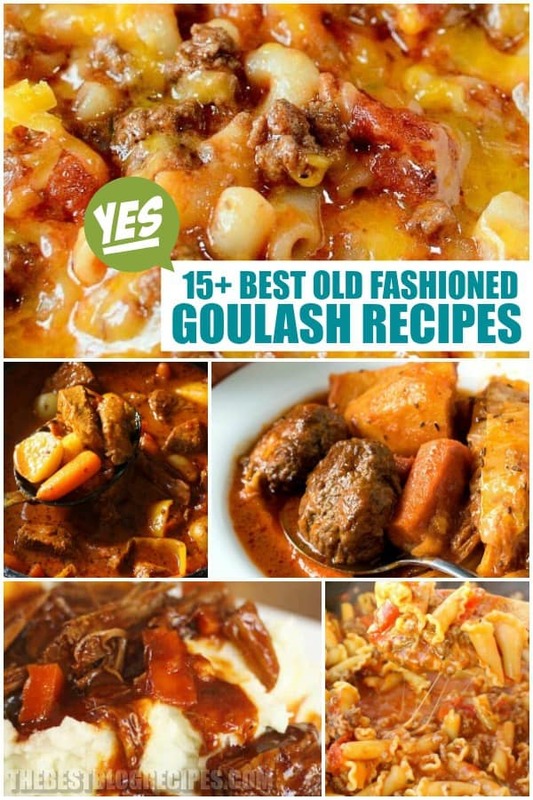 You say “goulash” and I say “yum!” But do I picture what you mean? 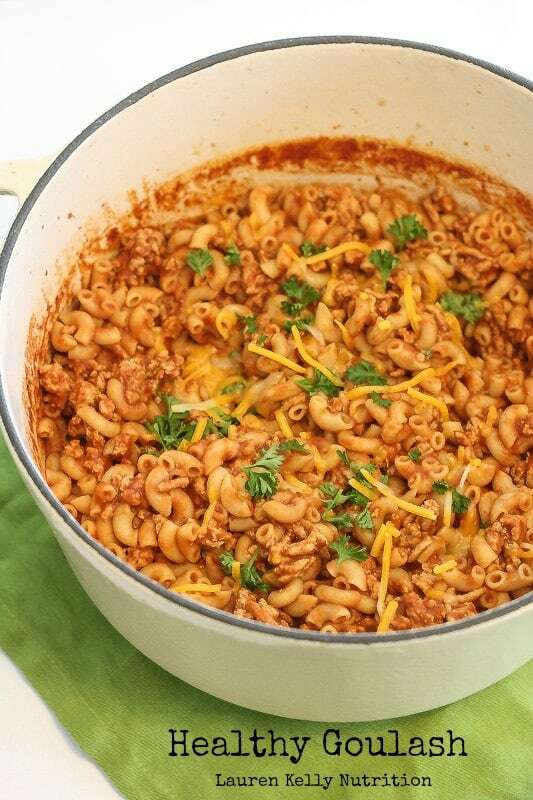 Are we talking about the American goulash that typically includes ground beef or hamburger, tomato sauce or tomato soup, and elbow macaroni like the recipe featured here? Adding two kinds of cheese morphs it into the best cheesy dinner! Or perhaps you mean the original Hungarian version with chunks of meat, onion, soup vegetables, and seasonings? And you could be thinking of goulash with venison, red wine, and dumplings! There are at least a dozen continental goulash versions and many more regional variations. Whatever recipe you end up cooking stovetop, crock pot, or oven baked, one-pot goulash is an easy family meal with simple ingredients. Basic goulash is an inexpensive stew of meat and vegetables, seasoned primarily with paprika with a few other spices. 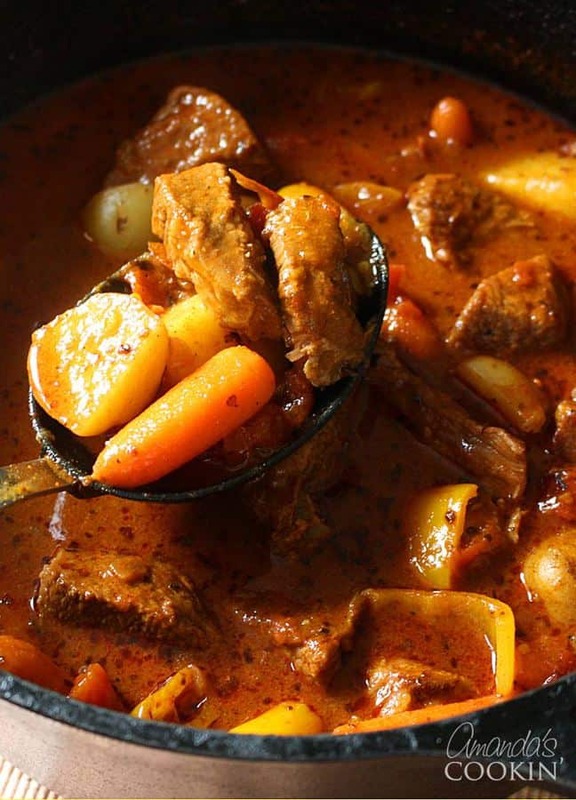 The name “goulash” comes from a Hungarian word that means “herdsman”. It came to mean a meat dish which was prepared and eaten by herdsmen. Hungarian shepherds sun-dried cooked and flavored meat which they then packed into bags made from sheep’s stomachs (where’s a plastic baggie when you need it?!). When they were on the move with their flocks and herds, they only needed to add water, vegetables, and seasonings to make their savory meal. You can also make goulash soup, which is similar to regular goulash but of course, it contains additional broth. 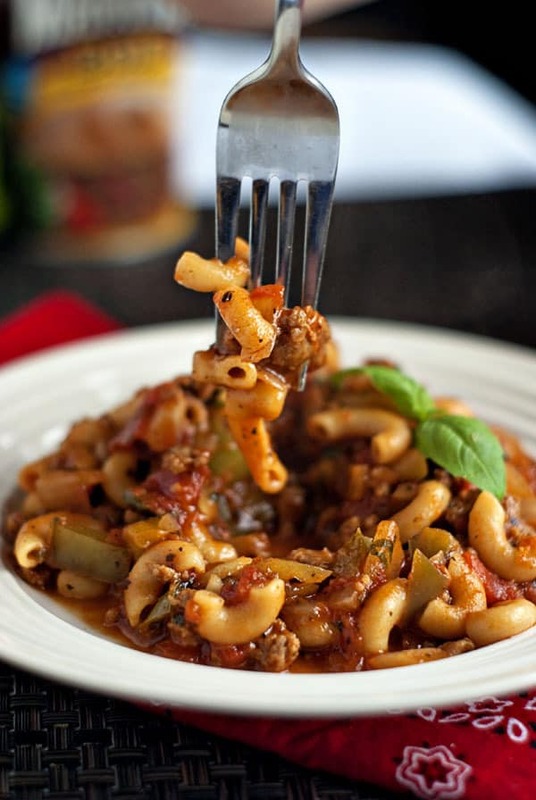 Goulash is known as a quick and easy dish to create and it is, especially when you use a ground meat, tomato sauce, and pasta combination. However, if you want to fix a more traditional Hungarian-type goulash with chunks of beef, plan on at least a couple of hours of simmering for tender meat. It is still a simple meal to prepare but you can’t get it on the table within 30 minutes! 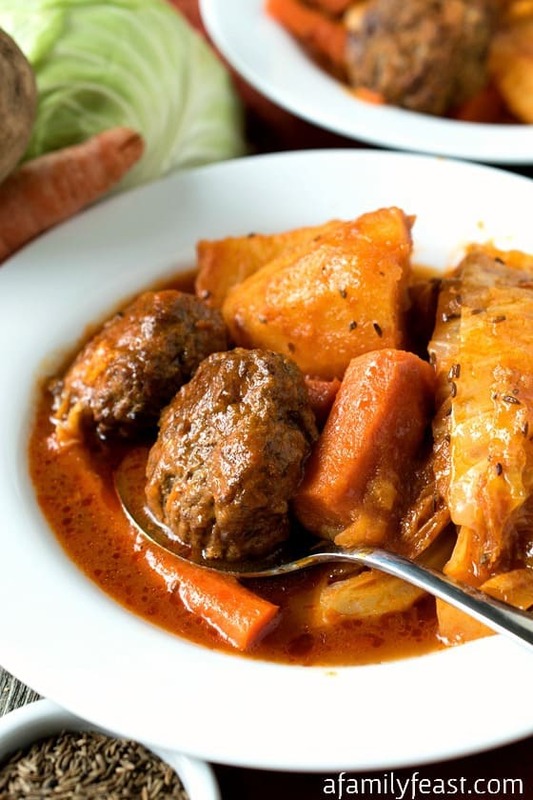 Most goulash recipes call for stovetop cooking of the ingredients but anyone with a crock pot knows how wonderful they are for cooking any kind of stew. If you don’t want to or can’t keep an eye on the stove, using a crock pot is a great way to tenderize the meat. And depending on the recipe, you can also start the ground meat and pasta on the stovetop and let it finish baking in the oven. And what to make with hamburger? Combine hamburger, macaroni, cream cheese, and mushroom soup for a white-sauce goulash. 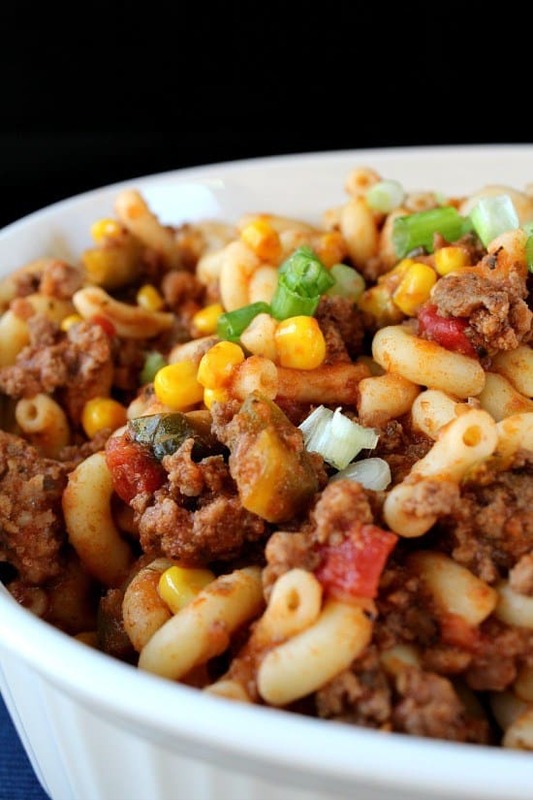 Give your hamburger-macaroni goulash a south-of-the-border flavor by adding corn, salsa, and taco seasoning. Like Italian? Use prepared spaghetti sauce and Italian seasoning over hamburger and macaroni. Enjoy a German influence with hamburger, lots of onions, bell peppers, cayenne, paprika, garlic, caraway seeds, and lemon juice and serve it over noodles. Doesn’t goulash offer a lot more creative potential than you thought? There’s a lot of flavor in there! Now if I say “goulash” can you picture what I mean? 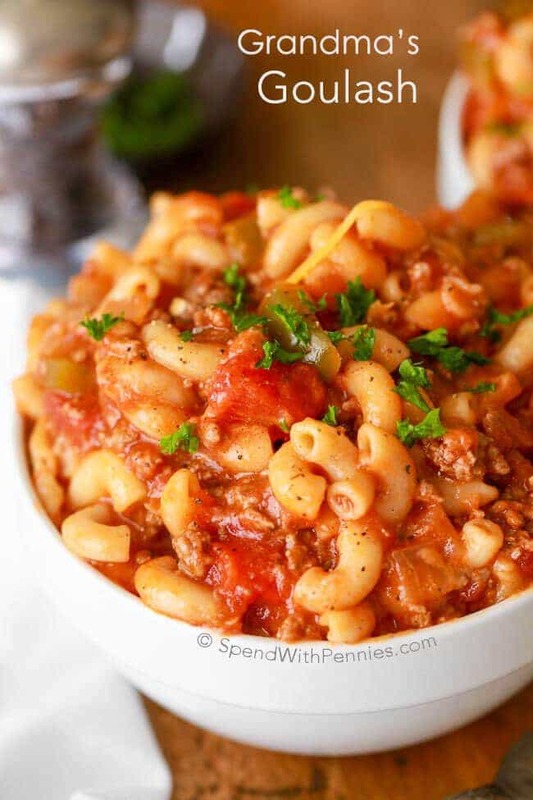 From Spend with Pennies :: Click HERE for the RECIPE This easy American goulash recipe is full of flavor and the perfect way to feed a crowd as it makes a huge batch! A simple skillet dinner with tomatoes, beef and macaroni noodles in a zesty tomato sauce creates the perfect comfort food on a budget! From Gonna Want Seconds :: Click HERE for the RECIPE American Goulash is a Family Favorite, ONE DISH meal that is perfect any time of year! My family has been making this recipe for 3 generations! From Favorite Family Recipes This Danish Goulash will quickly become a family favorite. 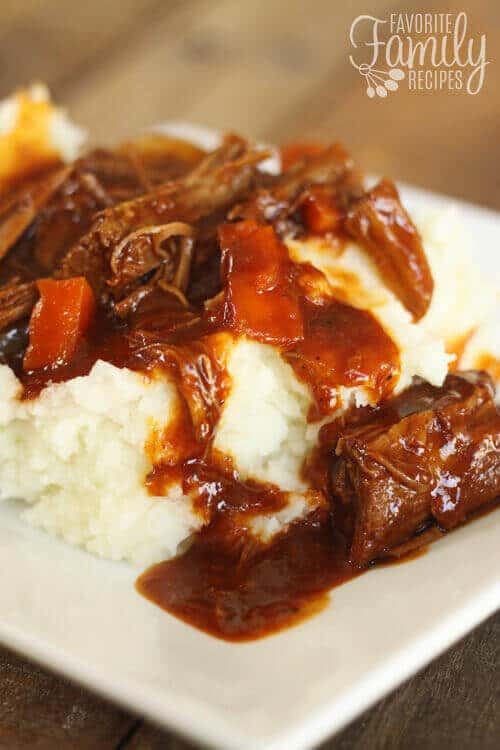 Tender chunks of beef in a rich, dark gravy. The perfect comfort dinner for a hungry family! From Delightful E Made :: Click HERE for the RECIPE In need of an easy weeknight dinner idea? 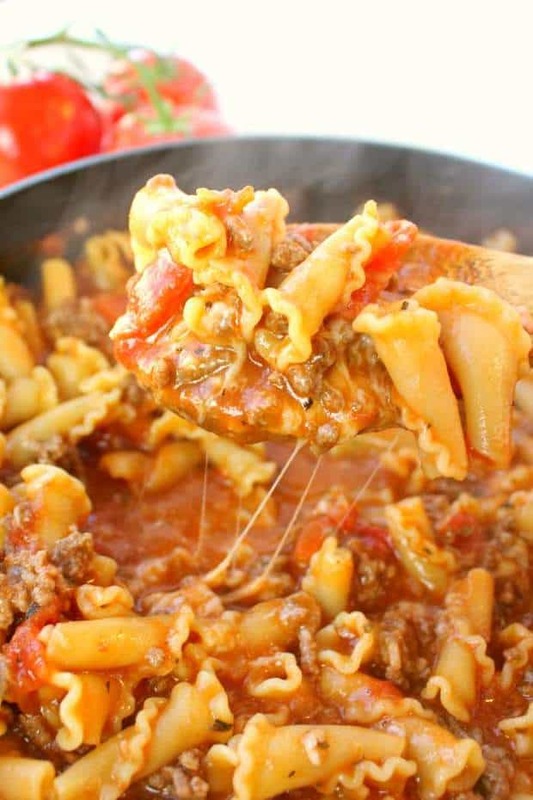 This One Pot Cheesy Italian Goulash is the perfect dinner solution and a fantastic ground beef recipe! Made with simple ingredients that you likely already have in your pantry, this one skillet pasta with meat sauce is fantastic for feeding your family any night of the week! From Spaceships and Laser Beams :: Click HERE for the RECIPE This Classic Goulash with Bacon combines your all time favorite dinner dish with bacon… and you know what they say — bacon makes everything better! 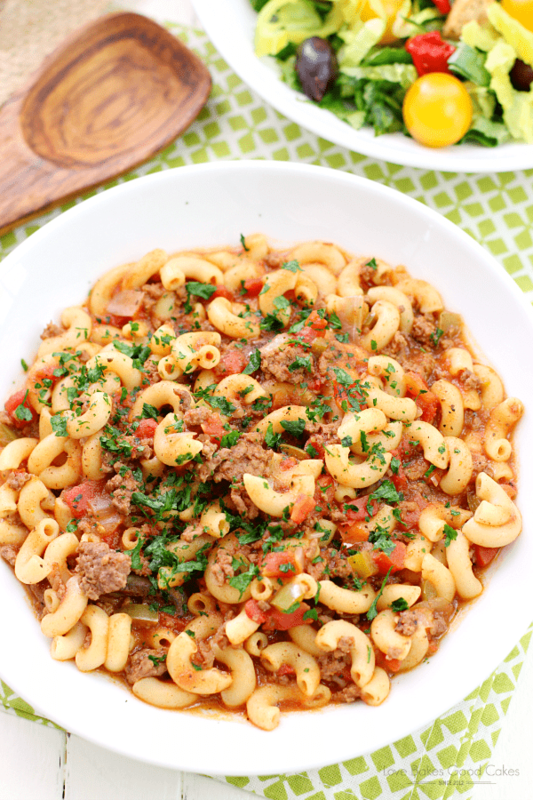 From The Midnight Baker :: Click HERE for the RECIPE This goulash is surprisingly easy to make in one skillet. It’s the ultimate comfort food that’s chock full of flavorful beef, tender vegetables, and potatoes! From Sweet and Savory Meals :: Click HERE for the RECIPE A healthy and delicious stew packed with flavor! 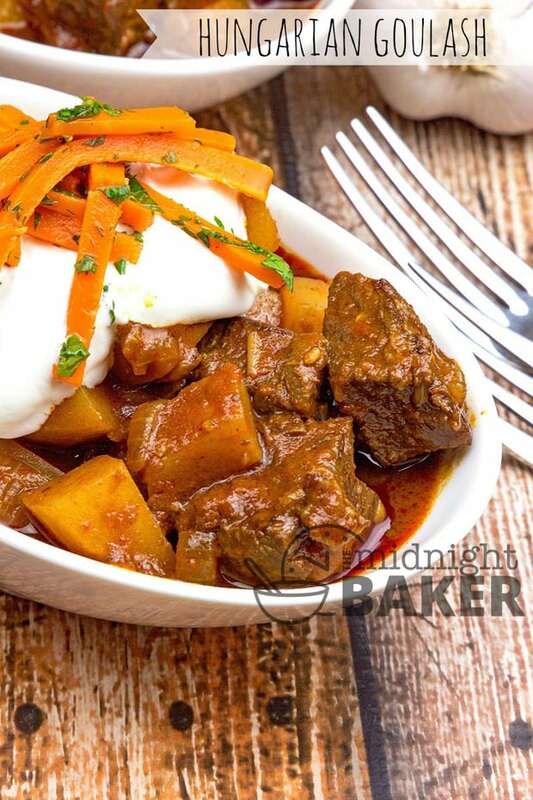 This goulash has amazing double smoked flavor and a nice spicy kick from smoked paprika. You don’t have to wait for cold weather to make this easy, delicious, and time-saver meal. 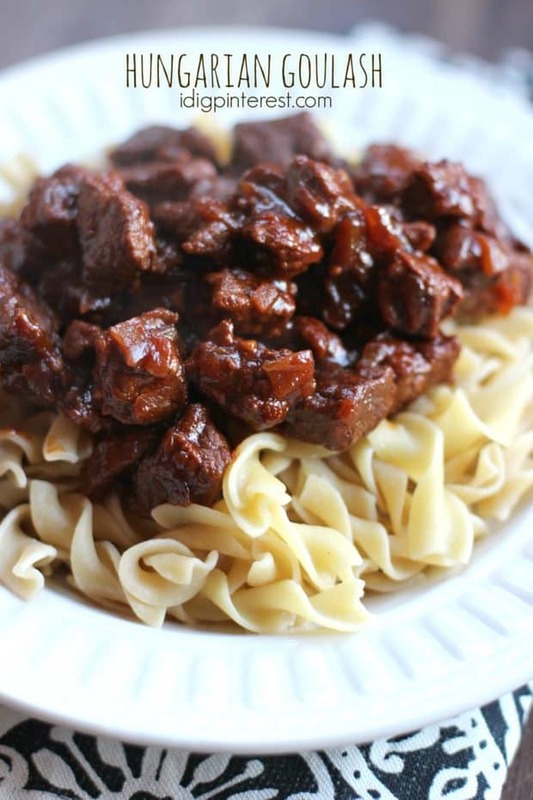 From Great Grub Delicious Treats :: Click HERE for the RECIPE Good ol’ beefy goulash! What a great comfort food! Growing up, we had goulash quite often. It’s such an easy meal to make and tastes great! 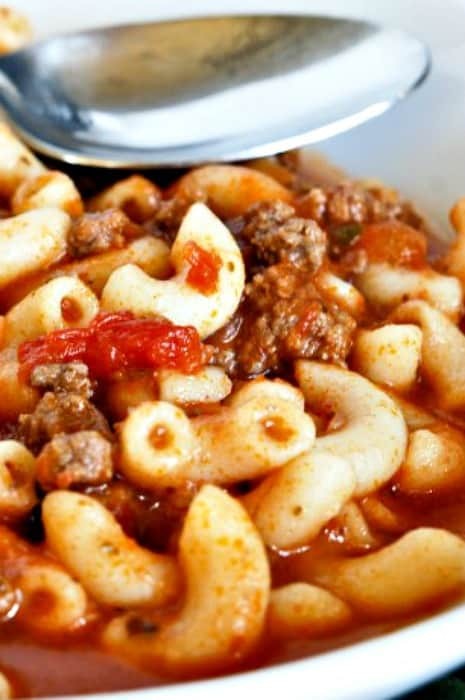 Kids love it, grown ups love it, everyone loves goulash! From Amanda’s Cookin’ :: Click HERE for the RECIPE Fall is the perfect time of year to make this dutch oven goulash. It’s an easy recipe using chuck roast that’s great for weeknights, especially those spent watching kids’ football games in the rain! Come home to a steaming bowl of stew on a brisk autumn day. This is also one of our favorites for “Sunday supper” during the cold winter months. 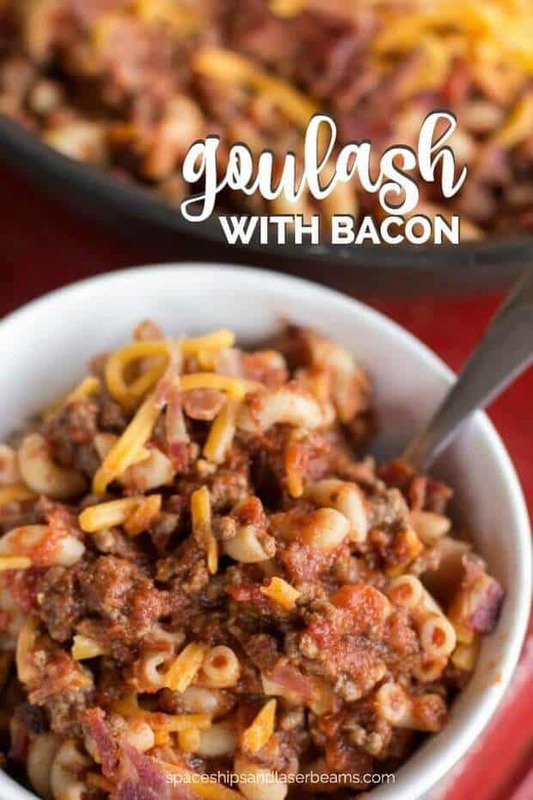 From Heather Likes Food :: Click HERE for the RECIPE This Sweet and Smoky Gouash has a fun twist on a traditional recipe that your kids will love! From A Family Feast :: Click HERE for the RECIPE Everything cooks together in the skillet until the vegetables are tender, then dinner is served! 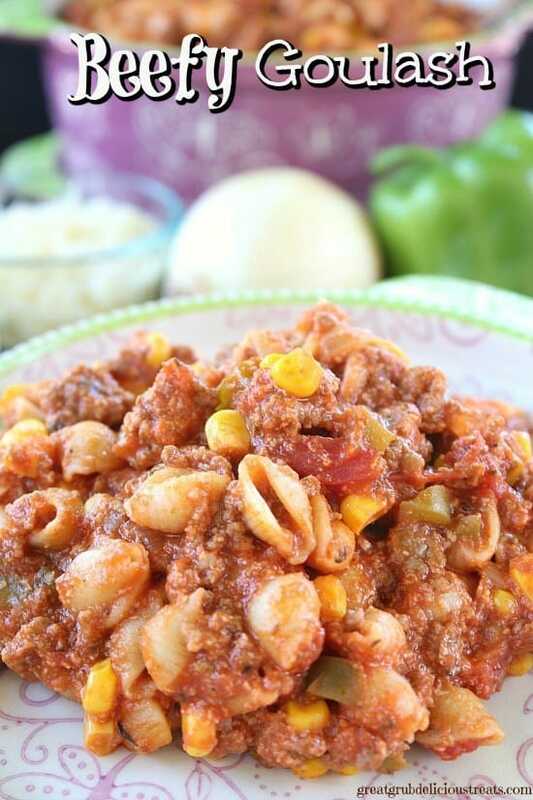 From Great Grub Delicious Treats :: Click HERE for the RECIPE This spicy southwest goulash is one of those meals that can quickly be made as a last minute, quick dinner, dish. 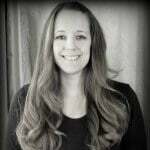 From I Dig Pinterest :: Click HERE for the RECIPE A flavorful, saucy, tender beef stew served atop a bed of egg noodles…Hungarian Goulash will be an instant family favorite! 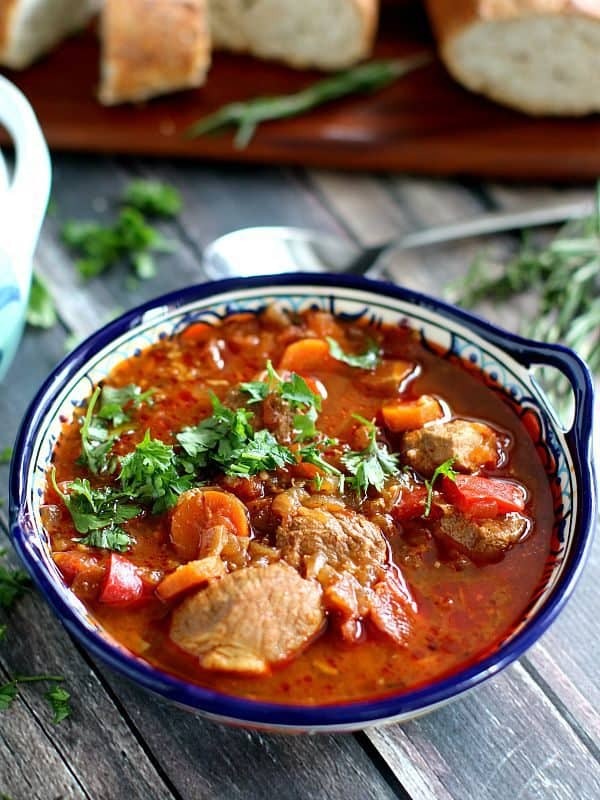 From Love Bakes Good Cakes :: Click HERE for the RECIPE This One Pot Goulash is comfort food that will remind you of Grandma’s kitchen! A hearty and satisfying dish! From Lauren Kelly Nutrition :: Click HERE for the RECIPE This is the ultimate comfort food and one of those quick dinner ideas that you will want to make over and over again. It just goes to show you that you can have those favorites and still eat healthy. This meal is perfect with a large, green salad on a cold winter night. From My Incredible Recipes :: Click HERE for the RECIPE This is one of those meals that everyone always loves. It’s beefy, cheesy and filled with pasta goodness. It’s the ultimate comfort food that a hungry family will gobble right up. Best of all, it’s super easy to make. Hi, Angel — you can find it HERE. Where is the link to the Danish Goulash recipe?? You can CLICK HERE for it 🙂 Enjoy! Your recipes look lovely. As a European trained dietician, I can tel you there is nothing in authentic Italian cuisine called goulash. German goulash has no hamburger, no pasta, just chunks of potatoes and beef. Call a spade a spade . . . These are mostly stews, hashes and casseroles of varying themes. In step #1 At the end of the step it says to remove from heat then step #2..It says something like Add garlic and olive oil and until meat is fully cooked? I’m guessing that means you put it back on the heat? If so why take it off in the first place? Sorry if that sounds bad, just wondering if their is a reason? And also thinking this all wouldn’t fit in a skillet? What is Adobo seasoning? What can I use instead of it. Hi, Valerie! It kind of reminds me of taco seasoning – it has garlic, oregano, cumin, onion powder, black pepper, etc. If you can’t find it in the spice aisle at your grocery store for some reason, I would suggest Googling and using a homemade version! Enjoy! I was just craving this the other day!